This is basically a QLabel and a "show this message again" checkbox which remembers what not to show. For production applications. In this context the class can be used to display messages which you don't need the user to see more than once. 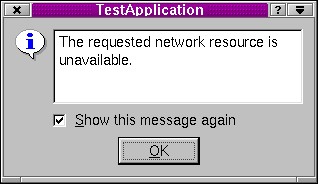 To use QErrorMessage like this, you create the dialog in the usual way and call the message() slot, or connect signals to it. For developers. In this context the static qtHandler() installs a message handler using qInstallMsgHandler() and creates a QErrorMessage that displays qDebug(), qWarning() and qFatal() messages. In both cases QErrorMessage will queue pending messages, and display them (or not) in order, as soon as the user presses Enter or clicks OK after seeing each message. See also QMessageBox, QStatusBar::message(), Dialog Classes, and Miscellaneous Classes. Constructs and installs an error handler window. The parent parent and name name are passed on to the QDialog constructor. Destroys the object and frees any allocated resources. Notably, the list of "do not show again" messages is deleted. Shows message m and returns immediately. If the user has requested that m not be shown, this function does nothing. Normally, m is shown at once, but if there are pending messages, m is queued for later display.